E-Learning is a new form of pedagogy for learning in the 21st century. E-Teachers are e-Learning instructional designers, facilitators of interaction, and subject matter experts. The roles of e-Teachers are to enhance learners' cognitive engagement and interaction. This is achieved by using the benefits of computer mediated communication- greater accessibility and adaptability. This article overviewed sociocultural theory, transactional distance, and computer mediated communication, which support the uniqueness of teaching aspects of e-Learning. Instructional contents, assessment strategies, and digital libraries are discussed as unique elements of e-Teaching. All the stakeholders of e-Learning should make efforts to close transactional distance and increase verbal immediacy. Seok, S. (2008). Teaching Aspects of E-Learning. International Journal on E-Learning, 7 (4), 725-741. Waynesville, NC USA: Association for the Advancement of Computing in Education (AACE). Retrieved April 21, 2019 from https://www.learntechlib.org/primary/p/24323/. Adams, D., Carlson, H., & Hamm, M. (1990). Cooperative learning and educational media: Collaborating with technology and each other. Englewood Cliffs, NJ: Educational Technology Publications. Ally, M. (2004). Foundations of educational theory for online learning. In T. Anderson, & F. Elloumi (Eds. ), Theory and practice of online learning (pp. 3-31). Athabasca, AB, Canada: Athabasca University. Andersen, J. F. (1978). The relationship between teacher immediacy and teaching effectiveness. (Doctoral dissertation, West Virginia University, 1978). Dissertation Abstracts International, 39, 4129. Andersen, J. F. (1979). Teacher immediacy as a predictor of teaching effectiveness. In D. Himmo (Ed. ), Communication yearbook 3 (pp. 543-560). New Brunswick, NJ: Transaction Books. Anderson, T. (2004). Teaching in online learning context. In T. Anderson & F. Elloumi (Eds. ), Theory and practice of online learning (pp. 273-294). Athabasca, AB, Canada: Athabasca University. Angelo, T. A., & Cross, K. P. (1997). Classroom assessment techniques: A handbook for college teachers (2nd ed.). San Francisco: Jossey-Bass. Arbaugh, J. B. (2001). How instructor immediacy behaviors affect student satisfaction and learning in web-based courses. Business Communication Quarterly, 64(4), 42-54. Baker, J.D. (2001). The effects of instructor immediacy and student cohesiveness on effective and cognitive learning in the online classroom (Doctoral dissertation, Regent University, 2001). Dissertation Abstracts International, 62, 2081. Berge, Z. L., Collins, M., & Dougherty, K. (2000). Design guidelines for web-based courses. In B. Abbey (Ed. ), Instructional and cognitive impacts of web-based education (pp. 32-41). Hershey, PA: Idea Group. Biggs, J., & Moore, P. (1993). The process of learning (3rd ed.). Sydney, Australia: Prentice Hall of Australia. Clark, R. E. (2001). A summary of disagreements with the “mere vehicles” argument. In R. E. Clark (Ed. ), Learning from media: Arguments, analysis, and evidence (pp. 125-136). Greenwich, CT: Information Age. Eggen, P., & Kauchak, D. (2006). Strategies and models for teachers: Teaching content and thinking skills (5th ed.). Boston: Allyn & Bacon. Fahy, P. J. (2004). Media characteristics and online learning technology. In T. Anderson, & F. Elloumi (Eds. ), Theory and practice of online learning (pp. 137-171). Athabasca University in Canada. Retrieved October 7, 2005 from http://cde.athabascau.ca/online_book/ch15.html Garrison, D. R., & Baynton, M. (1987). Beyond independence in distance education: The concept of control. American Journal of Distance Education, 1(3), 3-15. Greenstein, D. (2000). Digital libraries and their challenges. Library Trends, 49(2), 290-303. Harris, D. (1999). Internet-based learning tools. In D. French, C. Hale, C. Johnson, & G. Farr (Eds. ), Internet based learning (pp. 165-177). Sterling, VA: Stylus. Hawkes, M., & Terry, D.
Holden, M. C., & Wedman, J. F. (1993). Future issues of computer-mediated communication: The results of a Delphi study. Educational Technology Research and Development, 41(4), 5-24. Hughes, J. (2004). Supporting the online learner. In T. Anderson & F. Elloumi (Eds. ), Theory and practice of online learning (pp. 367-384). Athabasca, AB: Athabasca University. Innovations in distance education. (1998). An emerging set of guiding principles for the design and development of distance education. University Park, PA: Pennsylvania State University. Jensen, K. K. (1994). Relationships among verbal immediacy, message design logic, and teaching effectiveness. Unpublished doctoral dissertation, University of Kansas, Lawrence. Jones, B., Valdez, G., Nowakowski, J., & Rasmussen, C. (1995). Indicators of engaged learning. Indicators of engaged learning. Oak Brook, IL: North Central Regional Educational Laboratory. Jordan, F. F. (1989). An examination of the relationship between perceived verbal and paralinguistic immediacy and accommodation to perceived cognitive learning. (Doctoral dissertation, West Virginia University, 1994). Dissertation Abstracts International, 50, 2705. LaRose, R., & Whitten, P. (2000). Re-thinking instructional immediacy for Web courses: a social cognitive exploration. Communication Education, 49(4), 320-338. Levin, J. A., Riel, M, Myake, N., & Cohen, M. (1987). Education on the electronic frontier: Teleapprentices in globally distributed educational contexts. Contemporary Educational Psychology, 12, 254-260. MacKnight, C. B. (2001). Supporting critical thinking in interactive learning environment. In M. D. Cleborne & L. D. Maddux (Eds. ), The web in higher education, (pp. 17-32). New York: The Haworth Press. McLoughlin, C., & Luca, J. (2002). A learner-centered approach to developing team skills through web-based learning and assessment. British Journal of Educational Technology, 33(5), 571- 582. McLoughlin, C., & Oliver, R. (1998). 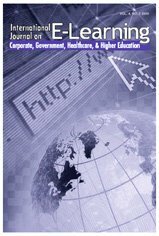 Maximizing the language and learning link in computer learning environments. British Journal of Educational Technology, 29(2), 12-136. McPeck, J. (1990). Teaching critical thinking. New York: Routledge. Mehrabian, A. (1969). Some referents and measures of nonverbal behavior. Behavior Research Methods and Instrumentation, 1, 203-207. Mehrabian, A. (1971). Silent messages. Belmont, CA: Wadsworth. Meyen, E. L. (1998). Teaching project team skills: Enhanced by the WWW. Focus on Exceptional Children, 30(6), 1-14. Meyen, E. L., Aust, R. J., Bui, Y. N., & Isaacson, R. (2002). Assessing and monitoring student progress in an e-learning personnel preparation environment. Teacher Education and Special Education, 25(2), 187-198. Meyen, E. L., Aust, R. J., Bui, Y. N., Ramp, E., & Smith, S. J. (2002). The online academy formative evaluation approach to evaluating online instruction. The Internet and Higher Education, 5, 89-108. Meyen, E. L., Aust, R. J., Gauch, J. M., Hinton, S. H., Issacson, R. E., Smith, S. J., et al. (2002). E-Learning: A programmatic research construct for the future. Journal of Special Education Technology, 17(3), 37-46. Moallem, M. (2003). An interactive online course: A collaborative design model. Educational Technology Research and Development, 51(4), 85-103. Moore, M. G. (1991). Editorial: Distance education theory. The American Journal of Distance Education, 5(3), 1-5. Retrieved October 14, 2005, http://www.ajde.com/Contents/vol5_3.htm Moore, M. G. (1993). Theory of transactional distance. In D. Keegan (Ed. ), Theoretical principles of distance education, (pp. 22-38). New York: Routledge. Moore, M. G., & Kearsley, G. (1996). Distance education: A system view. Belmont, CA: Wadsworth. Morgan, C., & O’Reilly, M. (1999). Online assessment: Creating communities and opportunities. In S. Brown, P. Race, & J. Bull, (Eds. ), Computer assisted assessment in higher education (pp. 149-161). London: Kogan Page & SEDA. Ni, S. F. (2004). Teacher verbal immediacy and sense of classroom community in online classes: Satisfaction, perceived learning, and online discussion. Unpublished doctoral dissertation, University of Kansas, Lawrence. Nuttall, J. (2002). Student and faculty members’ perceptions regarding the quality of instruction provided in online coursework (Doctoral dissertation, Texas A & M University, 2002). Dissertation Abstracts International, 64, 3613. Overton, T. (2003). Assessing learners with special needs: An applied approach (4th ed.). Upper Saddle River, NJ: Pearson Education. Palloff, R. M., & Pratt, K. (1999). Building learning communities in cyberspace. San Francisco: Jossey-Bass. Prensky, M. (2000). Digital game based learning. New York: McGraw-Hill. Salmon, G. (2000). E-moderating: The key to teaching and learning online. London: Kogan Page. Schunk, D. H. (2004). Learning theories: An educational perspective (4th ed.). Upper Saddle River, NJ: Prentice-Hall. Seok, S. (2006). Validation of indicators by rating the proximity between similarity and dissimilarity among indicators in pairs for online course evaluation in postsecondary education. Unpublished doctoral dissertation, The University of Kansas, Lawrence. Shaffer, D. W., & Resnick, M. (1999). Thick authenticity: New media and authentic learning. Journal of Interactive Learning Research, 10(2), 195-215. Sherry, L. (2001). Internet and world wide web usage in an institution of higher learning. In C. D. Maddux & D. L. Johnson (Eds. ), The web in higher education: Assessing the impact and fulfilling the potential (pp. 91-105). Binghamton, NY: The Haworth Press. Smith, S. J., & Meyen, E. L. (2003). Applications of online instruction: An overview for teachers, students with mild disabilities, and their parents. Focus on Exceptional Children, 35(6), 1-15. Stein, D. S., Wanstreet, C. E., Calvin, J., & Overtoom, C. (2005). Bridging the transactional distance gap in online learning environments. The American Journal of Distance Education, 19(2), 105-118. Trentin, G. (2001). Designing online education courses. In C. D. Maddux & D. L. Johnson (Eds. ), The web in higher education: Assessing the impact and fulfilling the potential (pp. 47-65). Binghamton, NY: The Hawthorne Press. Tudge, J. R., & Scrimsher, S. (2003). Lev S. Vygotsky on education: A cultural-historical, interpersonal, and individual approach to development. In B. J. Zimmerman, & D. H. Schunk (Eds. ), Educational psychology: A century of contributions (pp. 207-228). Mahwah, NJ: Lawrence Erlbaum. Wiener, M., & Mehrabian, A. (1968). Language with language: Immediacy, a channel in verbal communication. New York: Appleton Century Crofts.